On A Tight Travel Budget? You'll Appreciate This Year's July 4 Bargains : The Two-Way Record numbers of Americans are expected to be traveling over the long holiday weekend. Both gasoline prices and airfares are down from 2015, making holiday trips more affordable for millions. 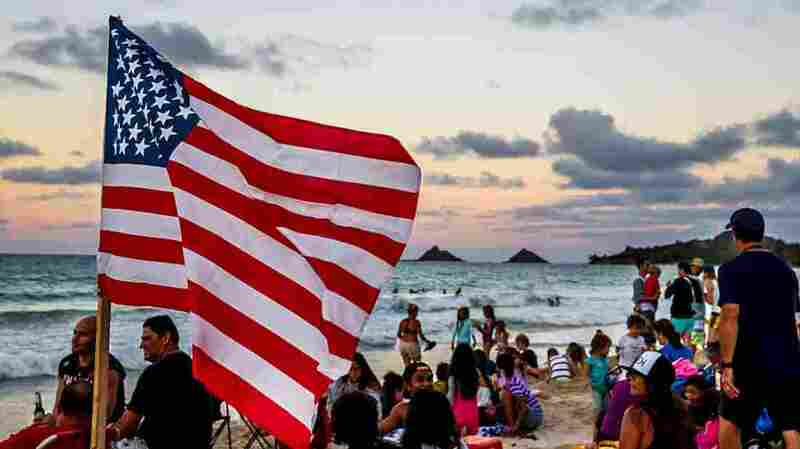 Crowds gather to watch the Fourth of July fireworks show last year at Kailua Beach on the Hawaiian island of Oahu. Whenever July 4 lands on a Monday, travel surges as Americans take advantage of the long weekend. And you might assume the extra demand for gasoline would send pump prices higher. But this year, drivers are discovering that prices have been falling in the run-up to the holiday — down to the lowest midsummer levels in more than a decade. AAA, the auto club, says that on Friday, the national average for a gallon of regular gasoline slipped to $2.28, down three cents just from Monday. For perspective, remember that two years ago, the national average was about $3.66. Peak summer prices haven't been this low since 2005. So here's some math that is actually fun to do: If you are buying, say, 12 gallons to fill your tank for the weekend, you will be spending $16.56 less than in 2014. Taking advantage of holiday sale prices at major grocery chains, those pump savings could allow you to buy a package of eight hot dogs, buns, a large bag of chips, a jar of salsa, mustard and a 2-liter bottle of soda — and still have change left from your $16.56. Get in the car, kids! Let's go for a picnic! But give yourself extra time to get to the park because roads are likely to be crowded — and not just for July 4. The whole summer is looking strong for travel. "This year's summer driving season is likely to set new records for both gasoline demand and vehicle miles traveled," AAA said in a statement. Thanks to cheap oil, "drivers are likely to continue paying prices unseen for the summer months in more than a decade." The recent downward pressure on prices is tied to the June 23 vote in the United Kingdom to exit the European Union. Markets took Brexit as a sign that global growth will slow, and that the dollar will stay strong. Since oil trades in dollars, a strong U.S. currency makes it more expensive for people in other countries to purchase oil, and that dampens their demand for it. Cheap oil also means cheap jet fuel, and that in turn helps restrain airfares. Average airfares for the top 40 domestic routes will be down 9 percent for the Independence Day travel period, according to AAA's Leisure Travel Index. In all, AAA predicts that for the holiday period lasting from June 30 to July 4, more than 36 million people will drive to holiday destinations — up 1.2 percent from 2015 — and that an additional 3.3 million will fly, up 2.2 percent. Airlines for America, the trade organization for major airlines, says that for the entire summer, passenger volumes will exceed last year's all-time high by 4 percent. So where is everyone going? According to the American Express Spending & Saving Tracker, we like the beach; about 4 in 10 vacations feature sand and waves. About one-third of trips involve visits to see family. About 1 in 5 travelers heads to a national park. And over a July 4 holiday, many Americans visit the monuments in Washington, D.C. Carie Krueger, a schoolteacher from Texas, came to the nation's capital to show her children the sights. "I wanted them to be able to experience everything that they're learning about in school now," she said. "They can actually see it in real life. ... It's really neat." But this year, with the dollar so strong and gasoline so cheap, a lot of other Americans are heading to Canada. Squaremouth, a travel insurance comparison website, says planned trips to Canada have surged by 70 percent this year. What if you hate driving on crowded roads? Consider a fall vacation. GasBuddy, a website that tracks prices, predicts drivers will see the national average for a gallon of gas slip below $2 as soon as early November. Pro trip from TSA: If you are flying for the Fourth, leave your firecrackers at home. NPR intern Justina Vasquez contributed to this report.